Before selecting a law firm, clients spend hours of online researching to know about the firm. The law firm website or the legal website must be transparent and should show how efficient they are in the past cases. From the website itself, the client must feel that the billable hours with your firm is worthy. Key aspects of a law/legal website are transparency, showcasing your best clients and partners, notable achievements and client testimonials. Designing a website for such a delicate high profile profession is a tough job. But, we have done the heavy lifting for you and let you make a sensible law/legal website within minutes. After showing all the fancy stats and self-boasting achievements, a law website must show the personality of the firm. Giving the option to know the associates in your firm and showing your firm event, will help the user understand the personality of the firm. 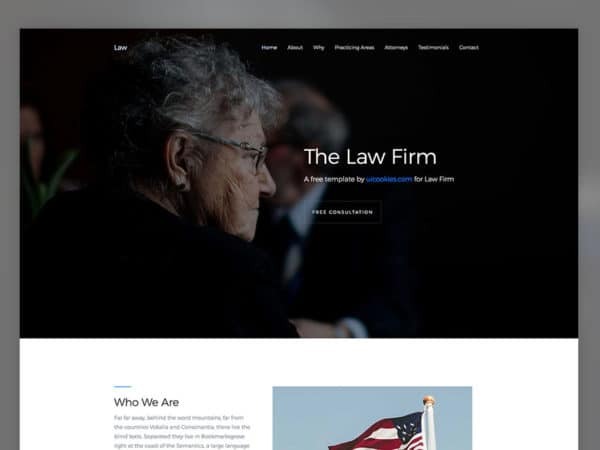 With our neat flexible website templates, you can show the personality of your firm and can convince your clients to take their first step towards your firm.